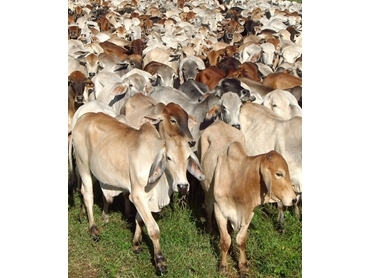 Althouth it is considered by many in the livestock advisory business that the fencing needed to set up a cell grazing system is unnecessary, as the same result could be achieved by implementing a strict rotational grazing regime using existing paddocks, that isn’t the experience of Chris and Marie Muldoon who manage Midway Station, South of Darwin. Covering 3000 hectares, it was purchased in 2004 by Marie’s family, the Underwood’s, and a year later, after Chris attended a Resource Consulting Services applied grazing course, a cell grazing system was begun. It uses a single electrified wire, supported by a star picket every 30 metres and a single strainer post at each end. The fencing subdivided the existing paddocks on the 1500 hectares of red sandy loam that grew improved pastures of Buffel, Jarrah, Sabi grass and Wynn cassia and resulted in 30 paddocks of 50 hectares being developed at a fencing cost of approximately $300/km. Midway is used to grow to live export weights 3,000 of the 5000, 14-18 month-old Brahman steer turnoff from the families’ properties in the Victoria River District, Riveren and Inverway. They arrive in November/December at an average weight of 250kg, with the aim of adding 90kg-100kg during the wet season. When they first arrive, due to compensatory growth, they put on up to one kilogram a day, and although that can drop to 0.3kg/day during monsoonal weather, they average around 0.8kg/day over summer. The entire herd is run together and during the height of the growing season they are moved to the next paddock every day, after consuming the top growth of the pasture. So it takes a month for them to return to the original paddock. That gives ample time for the pasture to re-grow, enlarge its root system and crowd woody weeds. Weed control is also helped by the grazing pressure, which although it is only two beasts/hectare overall, as there are 60 steers grazing each hectare, it eliminates their habit of selective grazing and early in the wet season they also eat some of the sida, the main woody weed. That has resulted in a reduction of 75 percent in the amount of herbicide needed to control the weed, a saving of $33,000 a year, and as the pasture density improves over time Mr Muldoon hopes to eventually eliminate the weed altogether. Although most of the steers reach the desired 340kg weight over the wet, there is always a tail and as the pasture dries off, the rest period is extended to eventually be 90-120 days. Spelling the paddocks for 30 days during the wet has eliminated cattle ticks, however buffalo fly is still a problem and it is kept at bay by the use of ear tags, the active ingredient of which is changed each year to help prevent resistance developing. The pasture is continually monitored and feed budgets worked out, to ensure the cattle have enough feed ahead of them to get them to market weight. They are weighed every month and dung samples are taken regularly for Near Infrared Reflective Spectroscopy analysis (NIRS), to determine the protein level of the pasture and when it drops it is corrected by water medication. A Nutridose water medication unit sourced from Brisbane based Pastoral and Feedlot Systems (Aus) is used to administer a nutrient solution containing urea, phosphate and sulphur, which costs 5-10 cents/head/day depending on the size of the animal and the level of nitrogen it contains. The property is ideally suited to water medication as there is no surface water and as the steers water from a single trough, only one Nutridose unit is needed. It and its 3600 litre nutrient tank are mounted on a trailer which follows the steers from trough to trough. Since implementing the intensive grazing system the stocking rate has been increased by 50 percent and the NIRS results show no fertiliser is needed by the pasture, which was costing $130/ha before the cell grazing system was introduced. During the wet the native pasture on the other half of the property is used to finish a few hundred spayed cows and the tail of these are moved to the cell during the dry, after the majority of the steers have been dispatched for live export. The high level of management, the monitoring of pasture quality and its careful use, along with the improved profitability at Midway was recognised recently when the Muldoon’s received the inaugural “Sustainability in Agriculture Award” from the National Farmers Federation during it’s annual conference in Brisbane. Pastoral and Feedlot Systems Australia supply cell grazing systems.